The order Psittaciformes is comprised of some of the most endangered birds on earth: fully one-third of all parrot species are at risk for extinction. The two main reasons for the decline in parrot numbers are loss of habitat and, in particular, the trade in wild-caught birds. WPT founder Mike Reynolds had voiced his concerns about this early on, and beginning in 2000 WPT trustee Cristiana Senni encouraged him and the trustees to push for a complete ban on the import of wild-caught birds into the European Union, to heavily reduce at least one of the threats facing psittacines. Progress and outcomes: In Jan 2007 the EU Commission announced a permanent ban on wild bird imports to Europe. The embargo stipulated that wild birds were not permitted entry with few exceptions. Quarantines were also tightened. Immediate consequences were seen in trapping countries, with overwhelmingly positive reaction from groups from all around the world. In July 1, 2007 the ban came into effect, stopping 2 million live birds from being imported annually, and eliminating the associated mortality of 50% or higher, sparing a further 2 million. 1990s - The Royal Society for the Protection of Birds (RSPB), RSPCA and Environmental Investigation Agency (EIA) campaign to end wild bird imports into the EU. Key airlines ban bird shipments, European Parliament passes Resolution to end imports. Commission takes no action. 1992 - USA passes Wild Bird Conservation Act - Bans imports of CITES listed birds, eliminating the world’s largest market. Championed by EIA, Defenders of Wildlife, Animal Welfare Institute (AWI) and the Humane Society of the US (HSUS), the Act leads to declines in poaching, disease and smuggling and provides a model for others to follow. 1993 - WPT rescues and releases 700 Goffin’s Cockatoos taken from trappers on Tanimbar in Indonesia, returning them back to the wild. This marks the first time WPT takes part in a confiscation and rescue effort. Nov 2000 – WPT Trustee Cristiana Senni encourages founder Mike Reynolds to push for EU Trade Ban. March 2001 – International Union for the Conservation of Nature (IUCN) and WPT publish Parrot Action Plan. Aug 2001 – Trade Ban proposal appears in PsittaScene. Oct 2001 – WPT launches Trade Ban petition. Dec 2001 - WPT initiates in-person EU whistle-stop tour - meetings in the UK, Netherlands and Belgium with RSPB, Birdlife International, TRAFFIC, Friends of the Earth, Eurogroup for Animal Welfare, RSPCA, World Society for the Protection of Animals (WSPA), BirdsFirst and others. This lays the groundwork for the developing coalition of NGOs calling for a permanent ban on wild bird imports. Dec 2001 - WPT supports trade work in Indonesia; Indonesian NGO Profauna works on domestic and international bird trade which leads to the zeroing out of Indonesia’s wild bird export quotas. July 2002 - Switzerland proposes CITES parrot exemptions. World Zoo Association (WAZA) and others support removal of many parrots from CITES. IUCN asks WPT for views; WPT joins others in strongly opposing the weakening of CITES regulations, and the proposal does not pass. Oct 2002 - WPT and Defenders of Wildlife support proposals to add 3 parrots to Appendix I of CITES. Current data on threats and need for added protection convinces CITES delegates to uplist Yellow-naped and Yellow-headed Amazons, and Blue-headed Macaws, protecting them from legal trade. Aug 2003 - WPT raises bird trade at CITES Animals Committee meeting. Cristiana Senni of WPT delivers paper highlighting unsustainable parrot harvest levels and destructive methods to the CITES Secretariat and to members of the EU Scientific Review Group in Geneva. Nov 2003 - Wild Bird Trade discussed in Parliament. MP Andrew George tables several parliamentary questions on the wild bird trade, which raises awareness at the political and public level in the United Kingdom. Feb 2004 - Quarantine disease outbreak: WPT reveals that Newcastle disease found in an Italian quarantine; neither vets nor international authorities notified as legally required. April 2004 - Baroness Miller tables Parliamentary Questions on bird trade and bird flu. First mention of the wild bird trade in the House of Lords; leads to close working relationship between Baroness Miller and WPT. April 2004 - WPT drafts Wild Bird Declaration. Working in collaboration with the Defenders of Wildlife, WPT initiates formal process of asking the EU to take action on imports of wild birds. May 2004 – On World Parrot Day WPT delivers 30,000 signatures supporting a EU ban of wild bird imports to Prime Minister Tony Blair at 10 Downing St., London to extensive media coverage. May 2004 - WPT invited to House of Lords. Baroness Miller invites Mike Reynolds, Cristiana Senni, and James Gilardi to discuss wild bird trade options over tea at the House of Lords. Aug 2004 - WPT & Defenders of Wildlife seek to uplist 2 more parrot species and protect a third. Lilac-crowned Amazon and Yellow-crested Cockatoo added to CITES Appendix I.
Aug 2004 – New York Times runs WPT letter. WPT writes letter to the editor on the linkage between avian flu and the wild bird trade, encouraging USA to follow EU lead on stopping imports. Aug 2004 - WPT requests that the UK government take action on wild bird imports. Mike Reynolds writes Minister Ben Bradshaw raising the profile of the wild bird trade for the minister in charge of health and animal welfare in the UK. Dec 2004 - Key publication shows dramatic declines in traded parrots in Nicaragua. With the support of CITES-Nicaragua, Martin Lezama and colleague publish third parrot survey that shows 80% drop in some highly traded species in 10 years. This is first result of its kind, showing unsustainable impacts of trade on parrots. Dec 2004 - WPT submits Wild Bird Declaration to EU Member States & the European Commission. The Declaration is endorsed by over 230 NGOs, and details the health, conservation, and welfare basis for banning imports of wild birds, and formally requests that the EU take decisive action. Feb 2005 - Wild Bird Declaration partners meet in London. Key Declaration partners meet for the first time to clarify roles for each organisation and identify key steps forward for the campaign. Mar 2005 - WPT and Eurogroup expose lax quarantine. Meetings raise concerns with Commission about poor implementation of EU quarantine rules amid strong denials. European Food Safety Authority (EFSA) report commissioned less than two months later confirms concerns. Leads UK to request emergency action at EU level. May 2005 - Production of wrist bands to promote campaign. WPT and Defenders of Wildlife produce thousands of "Trade Bands" raising awareness and funds for campaign. May 2005 - The Ecologist runs cover story on wild bird trade. Tony Juniper (then director of Friends of the Earth) contributes powerful piece on trade to a broad audience, explaining the history of the problem, and the risks to conservation, welfare and biosecurity. Sept 2005 - The EU, via Commissioner Markos Kyprianou, temporarily bans imports of live birds and bird products in response to H5N1 avian flu arriving in British quarantine. Oct 2005 - Baroness Miller’s questions force the UK government to address real issues of disease risk coming from the wild bird trade in a public and on-the-record setting. Nov 2005 – Effects of temporary ban quickly apparent. Harvesting in most countries stops rapidly; no further outbreaks to date of H5N1 in exotic birds imported to EU. Smuggling generally declines as predicted by WPT and campaigners. Nov 2005 - UK commissions Dimmock report on UK/EU quarantine. Commission reviews quarantine procedures for wild birds imported to the UK and EU. First official recognition that large numbers of imported birds die in the trade chain. Highlights need for actions and solutions at EU level. Jan 2006 - Study led by RSPB reviews ’nest take’ in Old World parrots. 19 researchers review parrot nesting success in relation to trade. This influential paper inspires RSPB support for permanent ban and helps EU accept earlier science drawing similar conclusions. Jan 2006 - Oryx publishes pro-trade argument and WPT rebuttal. Pro-trade arguments (Why ban won’t work) articulated in public forum for the first time, WPT responds, defends Declaration, and makes the case for an outright ban as the most feasible and effective solution. Jan 2006 - RSPB supports permanent ban in their Birds magazine. This clear position from the leading authority on bird conservation in Europe spurs the UK Government’s changing position and that of the European partners of Birdlife International. April 2006 - Birdlife EU member organizations formally back import ban. Representing the largest bird conservation organizations in the EU, their formal position in favour of a permanent import ban is highly influential to governments, the EU, and others involved in wildlife trade. May 2006 - WPT encourages bird cards to be sent to Commissioner Kyprianou to thank him for his role in the temporary ban. Overwhelming response highlights the public’s concern over the EU role in the fate of millions of wild birds. July 2006 - British vets back ban. British Veterinary Association (BVA) backs permanent ban, followed quickly by the Federation of Veterinarians of Europe (FVE). Widespread and public veterinary support helps lobby both UK and EU at key moments in last 6 months of campaign. Nov 2006 - EU commissioned EFSA report & opinion published. Independent scientific panel concludes that disease and welfare risks associated with wild bird imports are high and of serious concern. Strong findings made lifting the temporary ban impossible without serious political risk. Nov 2006 - Meeting with both EU Health & Environment - WPT and partners meet with DG SANCO (Health) and DG Envi (Environment) to discuss permanent ban and EFSA findings. Highest level meeting yet on these key issues. Dec 2006 - British PM Tony Blair calls for permanent import ban. Tony Blair announces UK Government will call for permanent ban on imports of wild birds. First EU Member State to declare a positive position. Jan 2007 - EU Commission announces permanent ban on wild bird imports to Europe. Wild birds not permitted entry with few exceptions. Allows captive bred birds from select countries and tightens quarantines. Immediate consequences are seen in trapping countries. Overwhelmingly positive reaction is seen from groups from all around the world. Negative reaction from CITES. July 1, 2007 - Permanent Ban comes into effect. Stops 2 million live birds from being imported annually, and eliminates associated mortality of 50% or higher, sparing a further 2 million. 2008-2009 - WPT aids campaigns to ban exports from Indonesia and Mexico. Indonesia - Initial focus on developing and funding partner ProFauna’s efforts to draw attention to trade there, stop importations and prosecute violators trapping and trading protected species. Among many positive milestones is a campaign demonstration to urge the government to stop parrot smuggling. Mexico - Educational and other efforts by Defenders of Wildlife begun, supported by WPT. 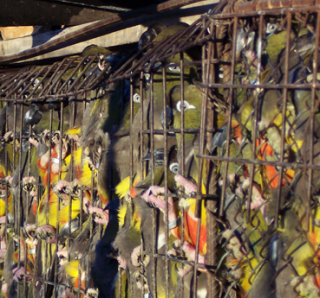 In 2008, the Mexican government permanently outlaws the trapping and export of their native parrots. 2009-current - In response to the urgent need to address the wild bird trade that still occurs in some countries the World Parrot Trust launches the FlyFree initiative, highlighting the destructive practice of capturing wild birds for the pet trade and gaining worldwide support to end it. Asia and the Middle East are two main areas still requiring focus to end legal and illegal trade. FlyFree encourages confiscations, helps law enforcement protect parrots, aids the rescue, rehabilitation and release of thousands of parrots into areas where they’ve gone extinct, and funds research in understanding the trade, region by region.